This week has flown by; my hope is that it slows down this weekend. 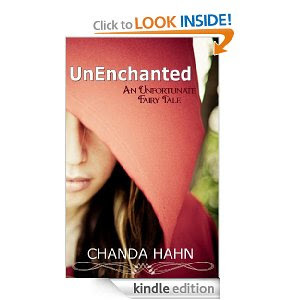 UnEnchanted (an Unfortunate Fairy Tale Book 1) by Chanda Hahn. You can see why I picked the book, actually, there were two reasons: One, it sounded like fun (which it was) and two, it was free…and still is. The characters were believable, the story maintained a steady momentum and it didn’t have the dreaded mid-story sag. I give this story 5 out of 5 stars. I will definitely read the second book. 1. What are the goals of the current project you’re working on? 3. If you could live in a painting or as a character in a movie or a book for a day, who or what would it be or what would it be and why? One final note * Look to your left, do you see the Amazon search tool to the side? I have put that there for you, and for this blog. If you purchase things (anything) on Amazon regularly, click on this search button and Amazon will give me a small percentage that will go toward giveaways for this blog.J It doesn’t affect your purchase price or anything like that, it only makes it so I’m able to afford giveaways for you – maybe I should write an “I love Amazon” song too. Just got the book. Great review Beth! Thanks Nicole, I really think you'll like it. I got this book a while ago and was wondering when I should get around to it. I must bump it up on my tbr list if it's that good. Great review. What inspires me? Showers. I think of the best stuff in the shower and get more writing done right after one. It was really a fun read...real light and very much a YA book.